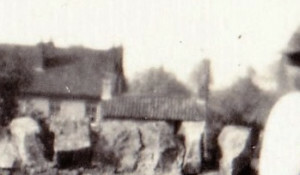 In the photo above on the left, the Roberts House is the one just visible in the centre behind the stone wall. Sadly little more than the roof can be seen. The plan on the right shows the house which is between The Nook and Yew Tree Cottage. We have called this property ‘The Roberts House’ because, as far as we know, it had no name and was not given a house number when house numbering was introduced in the 1950s. It was occupied by the Roberts family for about 35 years in the 1900s and they were possibly the last family to live there before the property was demolished in the late 1960s when the land was used for road widening. We don’t know when the house was built. It was there at the time of the Tithe Survey in 1840. At that time it was described as Plot 527, a cottage and garden owned and occupied by George Harvey. A sales notice dated 1947 describes the house as: ‘Detached stone-built and tiled house and garden, Gillingstool, Thornbury; let to Mr. C. Roberts at incl. rental of 8s 6d per week. Accommodation includes 3 bed, sitting room, living room with oven grate, pantry with sink and lean-to back kitchen with bath and W.C. Company‘s water and electricity. Main drains and Small Garden’. The sales notice indicates that the house had been owned by the late Mrs Elizabeth Trayhurn of Littledown, Olveston. This suggests that the Roberts were allowed to live in the house as part of his employment at Trayhurns the butchers. The 1841 census shows George living in the house with his wife, Catherine and their children. George was an agricultural labourer aged 55, born outside of Gloucestershire. Catherine was also aged 55 born in Scotland. Their children were William, a blacksmith aged 20, Anselm a mason aged 15 and Harriett aged 15. There was also another William Harvey living there – he was aged 6 and born outside of Gloucestershire (see Charles below). The 1851 census shows just George and Catherine living there with their grandson, William an errand boy aged 16 born in Bath and an adopted orphan, Mary Ann Davis aged 4. This census shows George was an agricultural labourer born in Somerset and Catherine was aged 69 born in Monmouth. George had married Catherine Harris in Thornbury on 30th June 1803. They had several children whilst they were living in Kington: Ann born on 7th August 1805 and baptised on 18th January 1807, Shadrack born on 31st December 1807 and baptised on 31st January 1808, Henry born on 10th September 1810 and baptised on 7th October 1810, Charles baptised on 13th June 1813, Mary Ann baptised on 18th February 1816, Charlotte baptised on 6th June 1819, William baptised on 16th October 1820, Anselm baptised on 24th April 1823, and Harriet baptised on 25th December 1825. George died aged 70 and was buried on 29th February 1852. Catherine died aged 75 and was buried on 31st August 1856. Shadrack – married Anne Savery on 17th July 1831. In September 1831 Shadrach was a mason living in Crossways when he and his wife baptised their first child Marianne. So far we have been unable to find further records of this family. Charles – married Susanna Lippiatt in Thornbury on 1st May 1834. Their children, William (1835), Elizabeth (1837) and Charles (1839) were born whilst the family lived in Bath. Susannah Harvey nee Lippiatt died in 1829. Charles himself was buried in Bath on 31st May 1840 at Beechen Cliff Place aged only 28. In the 1841 census Charles’s son, William was living with his grandparents George and Catherine in Gillingstool. William was living in Tytherington at the time of his marriage in 1859 to Ann Hendy. It is also noteworthy that on his marriage certificate William the occupation of his father Charles Harvey was described as a ‘brewer’. Harriett – she married George Davis a plasterer and the son of Daniel Davis, also a plasterer in Thornbury on 30th March 1846. Harriet died aged 23 years and was buried on 15th April 1849. We are not sure who was living in the house during the next 50 years. In the absence of any deeds and based purely upon the size of the house our best guess is that the 1901 census shows that the house was occupied by Jacob Garland. The 1901 census shows Jacob was living in the house with his wife and family. Jacob was a carpenter aged 48 born in Lovington, near Castle Carey in Somerset. His wife Emily A. was aged 47 born in Baltonsborough, Somerset. They had five children at home: Fanny aged 15, Margaret aged 14, William aged 10, Florence aged 8 and May aged 1. All the children except May were born in Butleigh, Somerset. Jacob was baptised at Lovington on 28th September 1851, the son of Isaac Garland carpenter and Elizabeth nee Flagg. On 10th January 1878 Jacob married Emily Ann Hodge, daughter of Thomas Hodge mason, at Baltonsborugh. It appears that the Garlands moved to the Thornbury area by 1896. A property sales notice printed in August of that year shows that they were renting a property in Morton near the Chapel at that time. In 1899 when their daughter May was baptised the family lived in Crossways. Jacob was listed as living in Gillingstool in the 1904 voters List. By 1907 he was listed as living in Lower Morton and by 1910 Voters List and the 1911 census the family had moved to Sibland. Jacob and Emily had by then been married 33 years. That census shows William had become a mason’s labourer and Jane was a nurse. A grandson Thomas Garland was also living there aged 1 born in Dursley. Jacob died on 18th January 1921 aged 69. Emily died on 31st October 1939 aged 85 years. Agnes Helen born in 1879. In the 1901 census she was a housemaid living at The Close, 42 High Street. She married Frank Roland Pearce in Thornbury in 1908. Agnes died on 29th November 1948. Isaac Thomas born in 1880. Alice Elizabeth born in 1883. She married John Reed in Thornbury in 1915. Fanny Louisa born in 1885. She married Charles E. Pearce in Thornbury in 1919. Electoral records show that the couple lived in Duckhole near Thornbury. Fanny Louisa Pearce died 19th February 1962 aged 76 years. Charles Edward Pearce died 3rd May 1968 aged 83 years. Both were buried in Thornbury Cemetery. Margaret Ellen born in 1887. She married Harold G. Wright in Thornbury in 1921. William Jacob born 18th August 1890. He emigrated to the USA on 19th June 1912. He married Florence May Gingell in Thornbury in 1924. They had two sons, Walter born in 1926 and Raymond in 1930. Florence died in 1938 whilst the family were living at Crossways. William married again in 1945 – his second wife was Victoria M Shipton. The electoral registers show they lived at Easton House, Crossways. Florence Mabel born in 1893. She married William Driver in 1929. William was a labourer the son of William Daniel Driver a farmer in Morton. In 1915 William must have been helping his father on the farm as he applied for an exemption from service in World War I on the grounds that his father had a crippled hand and no one else could look after the horses or do the driving or slaughtering. Florence died June 1st 1938 aged 45 years in Sibland, Thornbury and was buried in Thornbury Cemetery. The monumental inscription calls her Florence Maud, although the marriage certificate describes her as Florence Mabel. May Edith born in Thornbury in 1899. She never married. She continued to live with her mother in Crossways until she died in 1939. Thereafter she lived in Ferndale, Gillingstool with her sister Jane and her husband, Len Smith. We understand that May may have had to use a wheelchair whilst living there. There is an advert for an invalid chair placed by Miss Garland, Ferndale in 1948. She died on 24th April 1954. The 1911 census shows William living there with his wife and two children. William was a jobbing gardener aged 59 who was born in Thornbury. His wife was Emily who was aged 48 and had been born in Yate. Their children were May aged 19 and Harry aged 16, both born in Thornbury. Harry was working ‘at home’. They had one visitor, Lorna Danns aged 12 from Staple Hill and a boarder George Hammett a tailor aged 43 from Devon. William was baptised in Thornbury on 12th January 1851. He was the son of William Till, a labourer and his wife Hannah. In 1851 the census shows that William was living in Kington with his parents William and ‘Anna’ Till. William’s mother Hannah Till died aged 32 whilst the family lived at Crossways. She was buried on 5th January 1858. William’s father William Till was quick to remarry and married Elizabeth Allen on 19th August 1858. The 1861 census shows William and Elizabeth Till living at Crossways with young William then aged 10 and his sister Sarah aged 6 and step brother William Allen aged 7. In 1864 the records of the Workhouse show that ‘Mrs Till wife of William Till of Crossways’ complained that the medical officer, Mr Long, ‘had not attended her children who had been in fever for more than a week past the children having previously been under his care when his visits were discontinued’. Dr Long appeared before the Board and said the children were recovered from the fever and so visits were discontinued. By 1871 William was a farm servant for Joseph Ford at Over Court Farm in Almondsbury. In the census of 1881 he was still in the Over area of Almondsbury but he was a farm servant for Sarah Virgo. William married Emily Frances Susanna Tilley of Downend in the Keynsham area in the summer of 1882. Emily was born in 1862, the daughter of Thomas Tilley and his wife Sarah. William and Emily had several children: Charles William Burt Till baptised on 6th June 1883 (he died aged 1 and was buried on 29th May 1884), Alice Maud Emily baptised on 7th November 1886, Grace Evelyn baptised on 7th July 1889 (she died aged 10 months and was buried on 24th February 1890) and Carrie baptised on 22nd June 1890. In 1891 William was living in Grovesend Slade with Emily and their children, Alice M. E. aged 4 and Carrie aged 11 months. William was working as a domestic gardener. There was another son, Wilberforce G. Till aged 11 born in Downend. He had been born before William and Emily’s marriage and was registered under the name of Wilberforce Graham Tilley. They had two further children: Mary baptised on 12th June 1892 and William Henry baptised on 13th May 1894. In the 1901 census William was living in Grovesend with four children (Alice, Carrie, May and Harry) and his mother-in-law (Sarah Tilley aged 79). He was described as a ‘coachman (domestic)’. Emily was living away from home, working as a monthly nurse at the home of George Povey in Buckover. William and Emily had one more child, Edward James baptised on 11th April 1902. He died after 22 months and was buried in Thornbury Cemetery on 6th February 1904. The 1907 electoral register shows William living in Grovesend. By 1910 he is listed as living in Gillingstool and they were there at the time of the 1911 census. The 1913 electoral register seems to suggest that they may have moved from one house in Gillingstool to another. The 1918 electoral register shows William and Emily living in Grange Cottage, Morton. William died aged 92 and was buried in Thornbury Cemetery on 20th March 1943. His address at that time was Grange Cottage, Morton. Emily died aged 88 in the Poole area in 1950. We are not sure who lived in the house after the Tills until the Roberts family moved there in late 1930’s.